Gulf States Glass specializes in the installation of automotive windshields, Door Windows, Quarter Glass and Back Glass for all types of domestic and foreign cars. We serve customers in Slidell, Mandeville, Covington and Hammond along with surrounding areas. At Gulf States Glass, our focus is on you. That means we’ll do whatever it takes to ensure your satisfaction with our products and customer service. We come to your home or business for all your glass needs, Gulf States Glass is here to assist. With more than 40 years of combined experience, Gulf States Glass will offer you the support and service you can depend on. Our focus is on quality work at reasonable prices. We’ll make sure the job is done right. 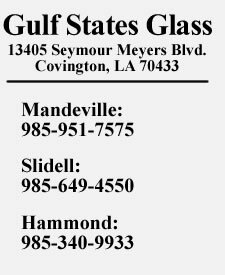 Call Gulf States Glass today for your free estimate.